Looking back now I believe that one of the problems (but not the only one) with Crônicas da Sétima Lua was the lack of playtesting. I myself never participated in a playtest until recently with Newt’s awesome Crypts &Things (more about it soon). The thing with playtesting here in Brazil is that I never saw one that worked. Measures like NDA don’t work with most brazilian players – Internet’s anonymity is just too much tempting. Together with this, we have the fact that brazilian RPG “industry” is microscopic, unprofessional and factious – most authors know each other and about half of them are always squabbling with the other half. They don’t trust people outside their inner circles of friends (or worshippers, if you catch my meaning) so playtests rarely are effective or objective. But – as usual – I’m digressing. This post is about one particular and interesting consequence of Chronicles of the 7th Moon lack of playtesting: Yaksha (singular and plural). Yaksha are a new race, made especially for the campaign setting of Isaldar (the 7th Moon). With their name taken from Indian mythology, Yaksha were created to fit the iconic role of the Cleric. When the Primordial World was destroyed by the Annihilation, the gods saved most of the mortal races by teleporting them to Isaldar – among these they Yaksha and their cities were the first to be saved. They’re a race of ascetics (creators of arts of the monk), sages and traditionalists. Like mythic India, their culture is old and filled with complex and sacred customs. In fact, Yaksha see most mundane and natural events as manifestations of the divine. Yaksha are also proud, cold and tend to be condescending with the “Younger Races”. Although I never mentioned it, I created Yaksha to fit a concept that’s very common in my gaming experience: the arrogant (and even slightly racist) Elder Race. Many of my (previous and present) players read Lord of the Rings and Dragonlance – especially the later. Because of this, they have a (annoying) habit of roleplaying elves as Lawful, disdainful and racist bastards. While some of these traits may have originated from one or two High Elves of Middle-Earth; the real culprits are Dragonlance’s Silvanesti and Qualinesti. 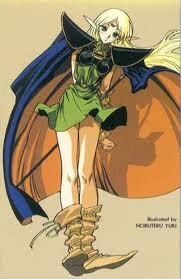 Anyway, D&D’s original and “basic” elves were Chaotic and carefree creatures, which a very different background – in my opinion the best example of a “D&D elf” is Deedlit, a character from the classic anime Records of Lodoss War. So, in order to satisfy those players above, I attempted to create an elder civilization of beautiful and proud humanoids, favorite of the gods, masters of divine magic and martial arts (and also psionics) – almost a mix of a Melnibonean with a Jedi. As a concept, it seemed fine to me. In reality it was a lot different. Basically, in the 4 or 5 years since Chronicles of the 7th Moon was launched (for D&D 3.5), I never saw one player using a Yaksha. In my own group only one player attempted to play with them, but he eventually abandoned the character. I believe that, if we had made a serious and objective playtest this “bug” would have been detected and – I hope – corrected. And here are the Yaksha for your perusal. I took the liberty of updating their stats for Pathfinder, but the flavor is the same, while the mechanic was barely touched. 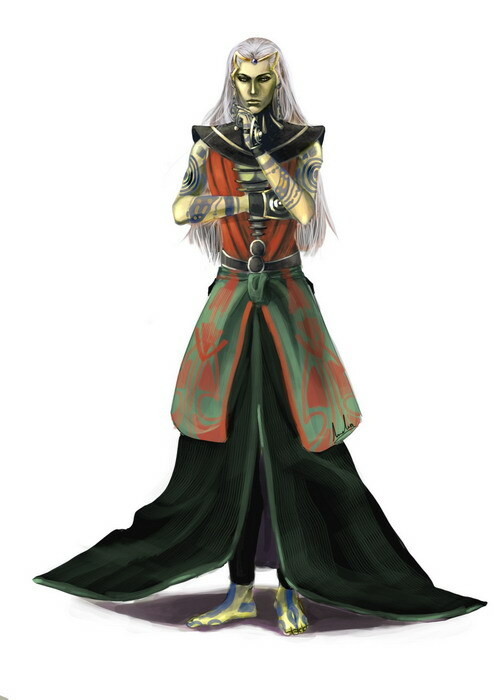 The mysterious and elusive Yaksha are one of Elária’s (a.k.a. The Primordial World) original and oldest races, brought to Isaldar by the Dead Gods. In fact – as the Yaksha love to remember other races – they’re the first to be saved from the Annihilation. The reason behind this favoritism are the Yaksha’s deep spirituality and piety before the gods. 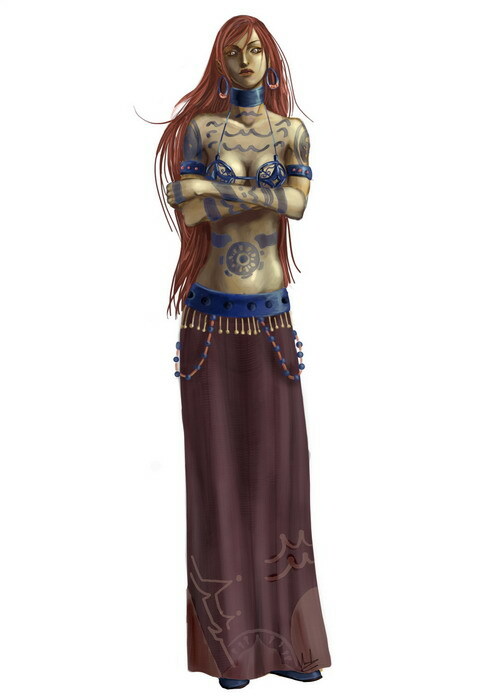 Considered the wisest among the humanoid races, they’re renowned for their religiosity and devotion. Yaksha are gaunt and frail, but possess greater willpower. They see themselves as the Beloved of the Gods and the Divine Elected. The Yaksha are accused of being cold and indifferent to the world. They’re called of “divine minions” or “Gods’ slaves”. Truthfully, Yaksha are relentless as agents of a religious cause or divine principle. However, Yaksha express this zeal in a balanced and detached way, rarely manifesting strong emotions. The mind of this philosophical race is labyrinthine and hazy for most humanoids of Isaldar. A Yaksha never directly addresses a point of view or even a person. He speaks through metaphors, analogies or abstractions. Watching a conversation between two Yaksha is an exercise in futility for most people, especially the chaotic and lively Elves. The Yaksha, in turn, consider a point of etiquette and a clear sign of an enlightened mind the ability to communicate in riddles. Only crude, barbaric and limited minds address directly the works of the Dead Gods. Yaskha are high and slender humanoids, easily exceeding 7-ft., but less robust than Humans or Giants. While this combination gives them an unearthly grace, it also lends a strange and gaunt bearing to the Beloved of the Gods. The most striking feature of a Yaksha are his metallic skin and golden eyes – whose irises are a mesmerizing sequence of discs of silver and copper. Their hair is straight and flowing, endowed with an opaque color, usually dark red, blue or silver white. Yaksha’s hands and feet have small claws, useless in combat. It is a custom among Yaksha to darken their hands and feet with black hypnotic patterns and mandalas. Yaskha appear to live in harmony with the elements. They ignore most weathers – a Yaksha can walk naked in the middle of a desert or in a blizzard with little discomfort. This is reflected in the light clothing used by them, usually togas and silk robes. Notorious for their wisdom and lore, the Yaksha are often sought as counselors and sages. Yaksha do not like the warlike presence of Dwarfs and the boisterous unclean ways of Half-orcs. They find Elves "peculiar" for their affinity with the natural forces, but believe that the Fey Folk is irredeemably lost for denying the Dead Gods. Humans bear their eternal disfavor... first because of their greed and impulsiveness, but mainly because of the Fall of the Gods. Due to this antipathy, Yaksha are more common in the Gnomic Republics than in the chaotic Human realms. The Yaksha’s prejudice does not extend to hostility and Humans are actually the lower (servant) castes of the Yaksha’s principalities of Aryavarta. Yaksha tend toward Neutrality. Their contemplative spirit and chaste ways result in a natural distaste to extremes. The Yaksha’s mentality of enlightenment and self-improvement also contribute to a Neutral alignment. On account of their piety, devotion and previous services to the Dead Gods, the Yaksha kingdoms and city-states – in the realm of Aryavarta – are located in pleasant and bountiful tropical lands, closer to the Scar – the Gods Grave. Their lands are famous for its rich temples and monasteries. Most Yaksha believe in the resurrection of the old gods through a natural rebirth, following the eternal cycle of reincarnation. Religion for the Yaksha is more than a personal choice: it is an intrinsic aspect of reality itself; everything comes from the Divine Wheel and everything will return to the embrace of the Gods. The Yaksha are renowned for paying tribute to all the Dead Gods, even chaotic and evil ones. However, they pay special tribute to Adar, Sardur and Melkar – called the Eternal Triad in the Yaksha mythology, without whom the world itself wouldn’t exist. Many wonder how the Yaksha’s faith survived the Fall of the Gods. To understand this you must first understand their unique vision of the Creation – the Yaksha see deities as incarnations of cosmic truths that only enlightened masters can perceive directly. Without a deity of fire, for example, there would be no fire. Hence it is impossible that the Dead Gods were actually destroyed by the Annihilation. The Yaksha believe that it is just a matter of time before the Dead Gods reincarnate. There are innumerous religious orders and sects in the Yaksha principalities. The more traditional ones believe that the Dead Gods will return and thus seek to help this Great Work. Other sects thinks that, because the deities represent absolute truths, they will surely return, but with new “masks” or “incarnations”. After all, Adar probably was not the first god of the elements. There must have been a previous "incarnation" of that Dead God. The name or appearance of a God thus can change with the vicissitudes of Creation’s kalpas. There are others, more obscure doctrines. The constant debate between philosophers, the hidden struggles among sects and courtly intrigues of temples are the Yaksha equivalent to Human’s politics. Yakshas have their own language, the Yaksharin. They also speak Common (Low Gnomish), Gnome (High Gnomish), Elven, Dwarf, Draconic, Celestial, Farnaxian (Infernal) and Orc. Typical Yaksha names for males, females and traditional families. Male: Ashenk, D'everk, Barass, Kalek, Tomok, Uras, Zalak. Female: Delenka, Harana, Jala, Lariní, Myria, Selan, Tarina, Velena. Family Names: Korashan, Urorrak, Tolon, Vass, Bekeshi, Jorlan, Lesker. In a world where the light of the Gods is gone, the main motivation for Yaksha adventurers is religion (maybe the Great Work of accelerating the return of the Gods). Pilgrimages, penances, searching for divine artifacts lost during the Fall or for remains of the Dead God’s bodies are common quests. Many Yaksha seek the bearers of the Divine Fire – the Luminars –, deemed probable "carriers" of the Returned Deities (some Yaksha sects see this thought as heretic). Yaksha with the Divine Fire find themselves morally obliged to discover the ultimate secret behind this “gift” and how to attain enlightenment. · +2 Dexterity, +2 Wisdom, -2 Constitution. Yaksha are graceful and wise, but frail and gaunt. · Golden Skin: +1 natural armor bonus. Yaksha’s skin is resiliente, granting some protection. · Awareness: +2 racial bonus on Sense Motive. Yaksha are famous for their emapthic skills. · Contemplative: +2 racial bonus on Concentration checks and Knowledge (Religion). Yaksha are thought meditation techniques and the lore of the Dead Gods from a tender age. · Mind over Body (Ex): Yaksha ignore most types of weather. In rule terms, they’re constantly under the effect of the spell endure elements. · Illuminated Sight (Su): Yaksha’s eyes are disturbing and hypnotic to most races. They’re immune to spells, spell-like abilities and supernatural effects that provoke blindness. · Divine Empathy (Su): A Yaksha’s bond with the divine allows him to feel the presence of the Dead Gods (or those touched by them). By concentrating for 1 round and succeeding at a Wisdom check (DC 20) a Yaksha can tell if a particular individual or object is divine touched (for example: a divine spellcaster, an outsider, a divine magic item or a Luminar). P.S. : I will not be posting game sessions' reports anymore. In part because I don’t have time anymore, spending most of my leisure hours helping my wife with our hobbit-girl here at home. Another reason is that game sessions’ report were never a “hit” in the blog. However, my Chronicles of the 7th Moon campaign is still going strong, after 4 years I believe, and we just ended our 54th session last week – quite a feat for a group that lives some 300 miles apart. I’m just back from a short vacation with my family. 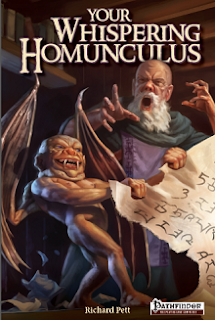 While I’m preparing a post on my first official (and failed) attempt on race design, he’s the newest review on one of Open Design’s newest product: Your Whispering Homunculus. Your Whispering Homunculus (YWH) is Kobold Quarterly’s blog most famous series (probably losing only to the Quarterly itself and the Patronage Projects’ news). Each YWH post is, basically, a small, very specific piece of (delightful, bizarre or humorous but always useful) game material – things like tables for strange tavern recipes, odd villagers, weird weather, local rumors (and superstitions), monsters with tainted blood (or made “unique” by past scars and wounds). Like forewarned by the author itself (Richard Pett) YWH is “(…) the roleplaying equivalent of spice added to meat to bring out a particular flavor (…)”. It’s the kind of stuff that while nonessential, it’s always flavorful (no pun intended) to enliven the game night when you less expected. The product YWH brings amazing 34 articles (in 166 pages) of game material. The inner layout is clean and simple, with the B&W interior art being practically non-existent (which make sense for a product of this type). While designed to be used in Pathfinder, YWH is easily converted to D&D 3rd and other d20 variants (in fact, most of its columns are system-neutral). You have columns like “20 Daft Bets and Dares” (with ingenuous and fun contests that challenge even high-level PCs), “50 Strange Entertainments”, “20 Holydays” (one of my favorites! ), “One Hundred Curious Emporiums”, “One Hundred Pointless Objects” (for those famous empty dungeon rooms), “It Came from the… Toilet?” (yours PCs never will trust a privy anymore), and “A Plethora of D12 Tables”. 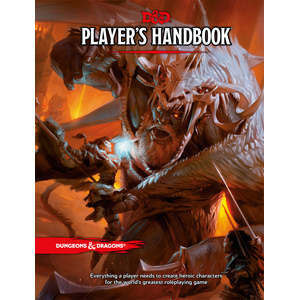 As you can see, YWH has a definitely Old School feel to it and is composed mostly of random tables (it reminds me of products like the all-time classic AD&D 1st Dungeon Master Guide and the recent Pathfinder Gamemastery Guide – for which the YWH’s authors was one of the contributors). Some of YWH’s articles are more rules-heavy, but always with a twist to the macabre and the whimsical. Columns like “20 Malfunctioning or Disappointing Magics” and “Malignant Magic” are full of excellent ideas and point unwaveringly to Richard Pett’s blatant Evil alignment. The various “Undiscovered Bestiaries” are also a good selection of variants for your usual dungeon monster. Another type of column that is an excellent resource on how to customize even the most ordinary encounters are the “For One Night Only” ones. However, it bears mentioning Pett’s advice on using most of YWH’s tables sparingly – otherwise you run the risk of overloading your players with bizarre and strange happenings, thus lessening their impact. YWH has a great production value and is an enjoyable reading even if your never manage to use it in your games (shame on you!). The tone of the book – narrated through a dialogue between a grotesque and hilarious homunculus and it’s evil master – is perfect (and we’re are eventually given stats for the duo). 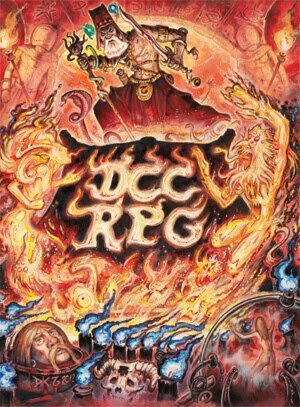 Its dark humor recalls the style of Warhammer FRP 1st, while its more delirious weirdness are totally in line with books like the first Fiend Folio – the fact that Richard Pett is from the UK is thus not a coincidence. I highly recommend YWH for any d20 fantasy Gamemaster. Because most of its columns still can be found at the Kobold Quarterly site, you may prefer the “Print + PDF” version.